Mammoth Ivory Polyhedral Dice - Moar Stuff - You don't need it but you know you want it. Dungeons & DragonsGifts for GeeksWTF? This complete set of Mammoth Ivory Polyhedral Dice is, by far, the most unique (and expensive) set of dice I’ve ever seen. These are perfect for the next time you get invited over to Bill Gate’s house for a round of D&D. That happens to you all the time, right? 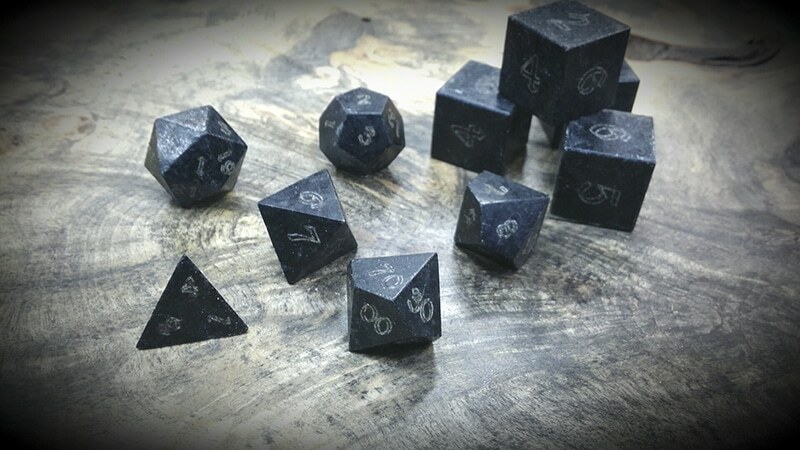 Made from the tusks of long-dead mammoths, these dice are perfect for use with your 12th level Aristocratic Necromancer. Each set includes a d20, a d12, two d10s (one regular, one percentile), a d8, Four d6,s and a d4. Each order comes in its very own storage box crafted from Eastern Aromatic Cedar and completed with a Black Walnut insert. Mammoth Ivory has some very unique characteristics hiding within its aged and flaky bark. The inner layers are polished to a brilliant luster and showcases a wonderful grain in the form of a subtle cross hatch pattern. They have a distinctively heavy weight along with a crisp sound when rolled. Due to the extreme age of Mammoth Ivory it does exhibit some natural cracking and patina. This has been left intact, but the cracks have been carefully filled, preserved, and stabilized. As a result, these dice will last another 10,000 years while retaining their aged beauty. Each Mammoth Ivory Polyhedral Dice include a Certificate of Authenticity attached to which is a sample chip of the tusk which was used to craft the dice. This is just in case testing is required to prove the die is made from actual Mammoth Ivory and not Elephant Ivory. This dice set would be the ultimate in luxury gifts for a D&D player. I’m sure Vin Diesel uses one (at least he could afford it). Each set includes a d20, a d12, two d10s (one regular, one percentile), a d8, Four d6,s and a d4. Due to trade bans, these dice cannot be shipped to the following states: California, New York, New Jersey, or Hawaii.